These custard filled pancakes are easy to do and lovely to eat. My hubby can eat 6 in one go! LOL. I can easily down 4. Lydia eats 2 with ease. I saw a few recipes and settled for one that uses Eno fruit salt because I know Eno gives batters a beautiful and delicious type of fluffiness. 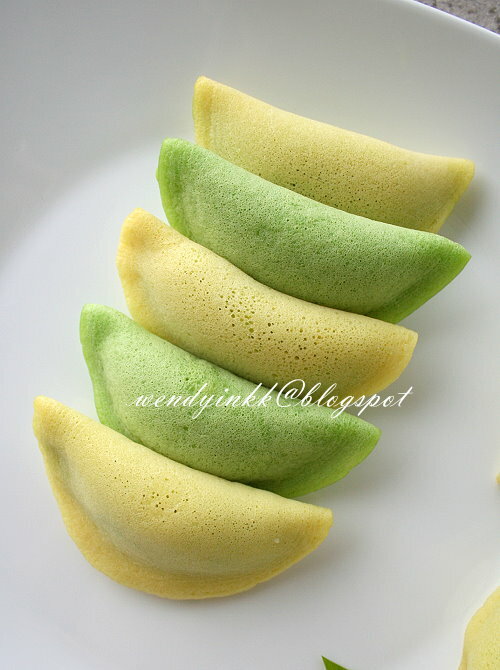 Later I found out that Kelantan and Terengganu also have this snack, but comes with the name Telinga Lembik (soft ears). Since all these states are near to Thailand, it's no surprise that this Thai influenced snack is also popular there. 1. 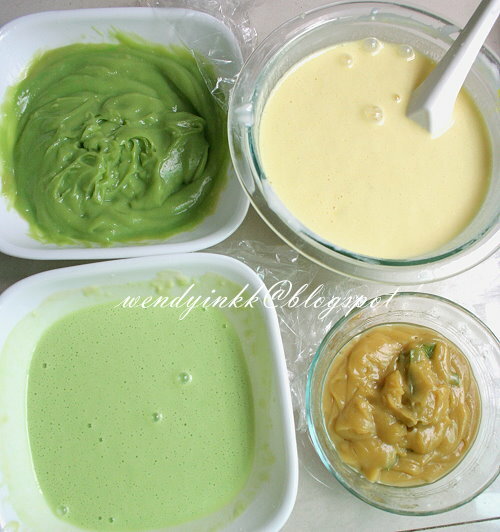 Mix flour, water and colouring together until a smooth batter forms. Add in Eno, stir it (it will fizzle) and leave it for 15 minutes. 2. Heat a frying pan on medium low heat, put in 2 drops of oil and wipe around with tissue. 3. Put in 1 Chinese soup spoon of batter and fry until the surface is fully set. 4. 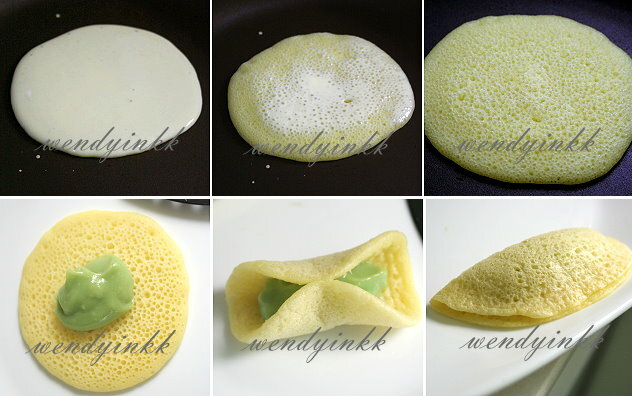 Remove the pancake onto plate and fry another piece of pancake. 1. In a small mixing bowl, beat eggs, salt and sugar until combined, put in cornstarch and mix until even. Add in coconut milk and stir to combine. Add in water and combine. 2. Pour the mixture into a heavy based saucepan. 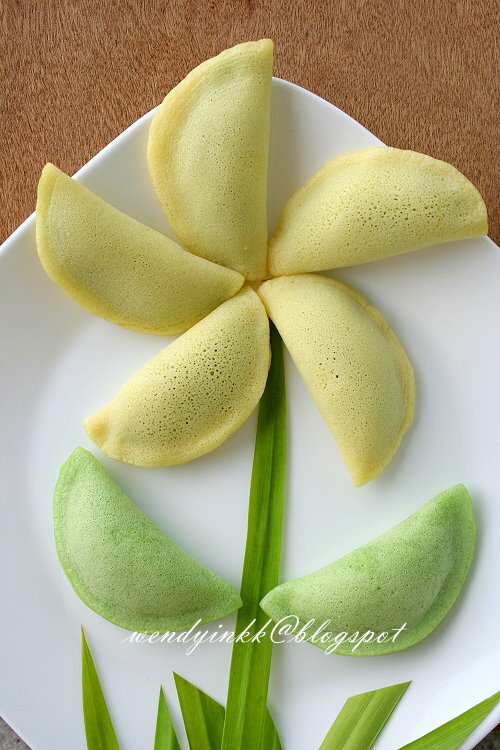 Put in pandan leaf. 3. Cook on medium heat, stirring al the time until the custard cooks and turns very thick. 4. Let it cool down before filling the pancakes. Like pancake. Must be yummy. You make this into pandan flavor too. Must be full of pandan aroma..nice. I made this in the Terengganu MFF is telinga lembik like you mention above. Love yours very much. Thanks for sharing. I love your recipes and have followed many with successful. Can I ask if I can replace coconut milk with fresh milk instead? Can't wait to try it out. Can I substitute the ENO with something else? Would love to try this one out. This is very nice and cute. What's the size of the pancake ? So sweet and cute. Nice photography too ! macam sedap je..eno tu eno yg untuk sakit perut tu ke..eno warna biru ke? I don't have to eat it to feel good. Your pics already convinced me... Really like the colour combination... sweet! My job ma, haha, at least 3 recipes. You can use self raising flour if you want, but the result will not be as good as Eno. I just bought a small pack. I hope u do! LOL. Day dreaming no good! LOL. But I found it boring cos I made flowers many times, hahah! Look sooo good & lovely! Can't wait to try . Can I cook the custard over water ( double boiled)? Have tried cooking 'kaya' direct fire & the texture was coarse. this one has cornstarch or custard powder in it, so it's much easier to handle. Use a whisk to stir it all the time. Cooks pretty fast! You can use double boiler if you want, but very slow la. 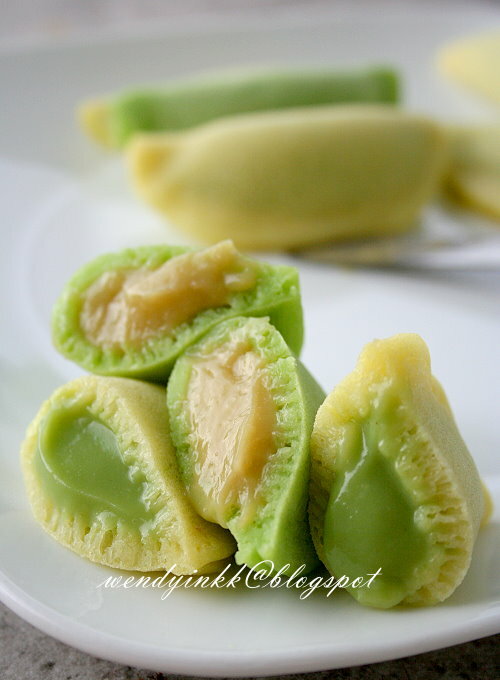 This recipe is so cool..I made the pandan flavour today..My family & friends all love this snack! But the sealing part is little bit tricky though, took me quite a while to get it done properly..The best part is, this recipe doesn't require any baking powder! Do you think I can use 'instant custard powder' for the custard fillings? becos I only have that in the fridge. I think you can use instant custard, just make it thick. I saw the pics on FB and they look good! Eno is the leavening agent here. Can i check with you, is it better to be eaten on the day it was made or can it be made the night before and put it in the fridge for the next day? Best eaten on the day itself. After chilling the pancake taste floury, like most pancakes do. very nice! i love how the colour turns out too! i will gobble few too at one go! wow the pancakes look so light and fluffy I can actually feel it even from the photos! no idea where to get these eno salts though urgh! You can replace with Andrews Liver Salt. It's also an antacid and it's fizzy,right? 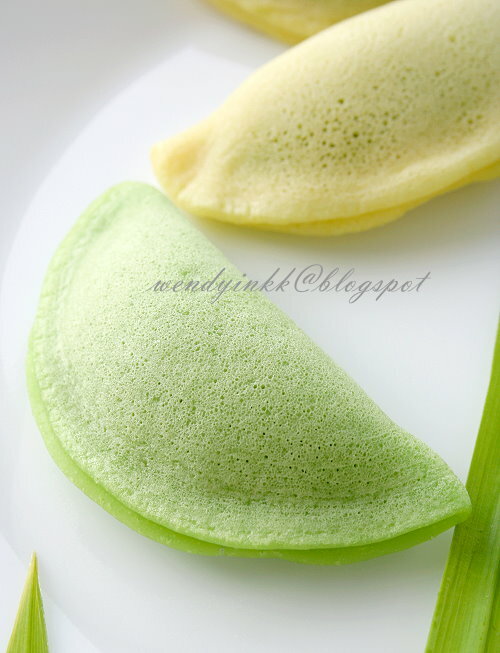 wendy nak mintak izin copy & paste recipe from yr blog..but cont la..huhuh nak buat Apam perlis nie..